It’s been quite some time since Andy Stenson, an assistant superintendent at Lucia Mar Unified School District, stood in front of students in his own classroom. But on this brisk day in mid-March, the district’s head of curriculum and instruction is back in his teaching element. MAKING PLANS : The district’s newly selected TAP leaders, including “master teachers,” met earlier this month to discuss training. From left to right are Andy Stenson, assistant superintendent of curriculum and instruction; Kelly Logue, master teacher for Dorothea Lange Elementary; Peter Ponomaroff, Teacher Incentive Fund coordinator; and Carol Littlefield-Halfman, the district’s executive master teacher. The lesson: merit-based pay for teachers. Stenson draws two circles on the whiteboard in his office and starts divvying them up into pie wedges, his black Expo marker slicing across the board. 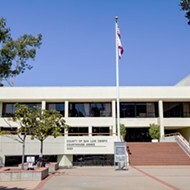 One circle, he says, represents merit-based pay for teachers whose students are required to participate in California Standardized Testing and Reporting (STAR). The other represents those whose students are too young to participate (STAR testing starts in the third grade). But to truly comprehend the meaning of those circles, one must first understand the system from which the data come—the Teacher Advancement Program (TAP). If you didn’t already notice, there are going to be a lot of acronyms in this article, so get ready for a healthy portion of alphabet soup. Last year, the district, which spans from Nipomo to Shell Beach, was selected by the federal government to receive a $7.2 million Teacher Incentive Fund (TIF) grant designed to attract and retain high-performing teachers. To receive that money, however, the district had to implement the Teacher Advancement Program (TAP). 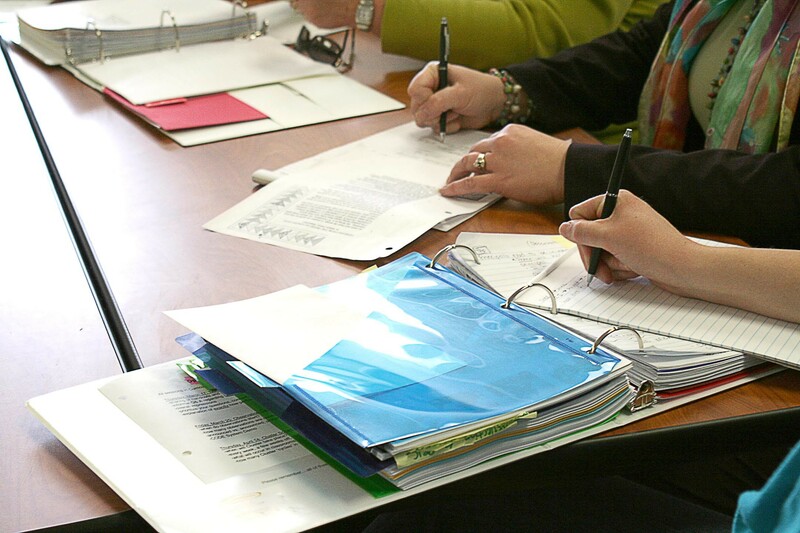 The instructional program that started in the late 1990s creates a system of specialized educators. Their goal? To improve teacher and student performance. Their tools? Professional development, merit-based pay, and other resources. According to Stenson, about 82 percent of the TIF funds will be used to hire more teachers and literacy specialists. The remaining funds will go toward teacher bonuses based on in-classroom performance reviews. 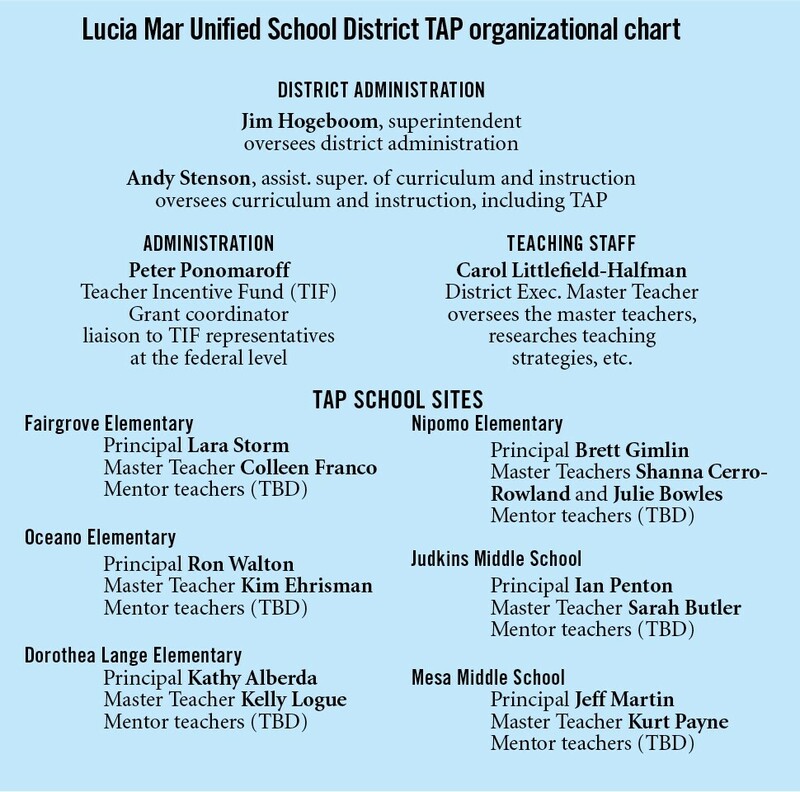 District officials spent several months presenting TAP fundamentals to administrators and teachers, including members of the Lucia Mar Unified Teachers Association. Eventually, the district and union negotiated amendments to the contracts of teachers working at TAP sites. The contract amendments stipulate TAP teachers will continue to receive their base salaries in addition to performance-based bonuses. In February, staff members at six of the district’s 17 schools—Dorothea Lange, Fairgrove, Nipomo, and Oceano elementary schools, and Mesa and Judkins middle schools—voted overwhelmingly in favor of implementing TAP into their curriculum. Beginning this fall, those six schools will become the first TAP sites in the state. If TAP sounds confusing, don’t worry. You’re not alone in thinking so. TAP and its specialized language, so to speak, are also controversial. There’s been ample research done in support of, and criticizing, the program. Proponents of TAP say it rewards good teachers and motivates under-performing teachers to do better. The program’s opponents, however, argue it has the potential to create a hostile teaching environment focused solely on standardizing testing. Stenson said he readily accepts the fact that people have differing opinions of TAP. What he doesn’t like is people basing those opinions on rumors and misinformation. “I study something before I stand up in front of a group of teachers and administrators and say, ‘This is good for you,’” Stenson said. 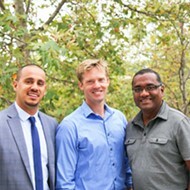 To back up its claim, TAP lists research from the program’s parent organizations, the Milken Family Foundation and the National Institute for Excellence in Teaching. First, the site said teacher quality is the most important school-related factor affecting student achievement, behind home environment and family. The site also said the country’s elementary and secondary schools will “need to hire more than 2 million new teachers over the coming years, and 50 percent of those new teachers are not expected to remain in teaching more than five years.” The turnover rate at high-need schools is even greater. Additionally, the site claims 36 percent of all secondary school math teachers aren’t certified or didn’t major in math. That percentage jumps to 60 for chemistry, physics, and earth and science instructors. The solution to the teacher quality crisis, according to TAP, is to implement a system of school and teacher accountability. Under the TAP system, school districts hire an executive master teacher to oversee teacher evaluations and professional development. Lucia Mar created a 19-person panel composed of teachers, principals, and administrators for its selection process. The executive master teacher has no classroom duties, but is dedicated to the TAP program. Typically, he or she receives a salary bonus of $10,000. The district also selects a master teacher and mentor teachers for each school site. Master teachers are responsible for researching and implementing new teaching strategies at their schools. Mentor teachers, as the name suggests, work under the master teachers. The executive master teacher for Lucia Mar is Carol Littlefield-Halfman, a current math teacher at Judkins Middle School. On the administrative side, the district appoints a TIF coordinator to ensure the TAP sites are adhering to the grant language and to maintain an open line of communication with federal officials. Lucia Mar’s TIF coordinator Peter Ponomaroff will also be available to fill in for school principals when they’re called on to do teacher observations in the classroom. Traditionally, at middle schools and high schools, an assistant principal would be able to take over those administrative duties. Elementary schools in Lucia Mar, however, don’t have assistant principals. Lara Storm, principal of Fairgrove Elementary in Grover Beach, said she’s looking forward to the added amount of support she’ll be able to give her teachers because of TAP. For example, in terms of student questioning, an exemplary teacher asks a variety of high-quality questions relevant to the lesson. An exemplary teacher also asks questions in ways that require active responses and generate student involvement and self-learning. All employees tasked with giving evaluations must pass yearly certification exams to prove they have a clear understanding of the TAP teaching rubric and other program features. Along with the teacher observations, TAP schools conduct grade-level profession development meetings—“cluster meetings,” in Tapanese. The cluster meetings will run for an hour each week during the school day, and are used to discuss curriculum. During that time, Stenson said, substitute teachers will take over classroom instruction. 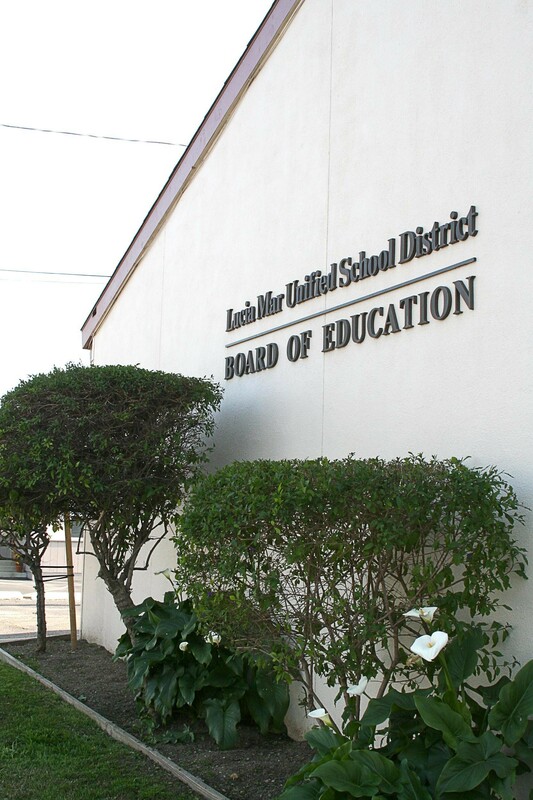 TRAILBLAZERS : Lucia Mar Unified School District, which spans from Nipomo to Shell Beach, is preparing to become the first school district to implement TAP, an education reform program that funds professional development and merit-based pay for teachers. The district will start TAP at six of its schools in the fall. He used the concept of “cause and effect” as a hypothetical cluster meeting discussion topic. Before TAP, the administrators held several district-wide professional development meetings every year. However, some critics of TAP have said the cluster meetings take away from class instruction time. 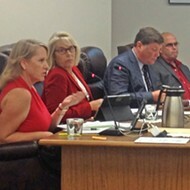 Proponents argue the meetings improve the overall curriculum and instruction process. Let’s get back to those circle graphs in Stenson’s office. The merit-based pay aspect of TAP has several components. According to information from the TAP website, approximately 50 percent of the grant money set aside for teacher bonuses is awarded based on teachers’ performances. Teachers at TAP sites are evaluated four times a year through classroom observations. The teachers’ rubric scores are averaged at the end of the year. Teachers who get a cumulative score of 2.25 or higher are eligible for bonus pay. The remaining 50 percent is broken down so 30 percent is allocated based on individual classroom testing achievement growth and 20 percent is based on overall school testing achievement growth. 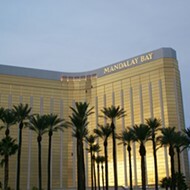 The test scores and improvement measurements will be computed by an outside vendor. Teachers whose students don’t participate in STAR testing or don’t have past test scores from which to measure academic growth have a different bonus pay breakdown. The pay for those teachers is broken up with 50 percent for overall school testing performance and 50 percent for teacher performance. Stenson said the district has allocated approximately $3,000 per teacher per year. NEW SCHOOL OF THOUGHT : TAP will require site teachers to undergo quarterly evaluations based on a 19-point instructional rubric. That rubric is used, along with individual student and school test scores, to determine how teacher bonuses are allocated. The program’s critics argue that money and the rest of the TIF grant funding should be going directly into the classroom, not into the pockets of teachers and administrators. “The district wrote a grant that is tailored specifically to the TIF objective,” Stenson explained. 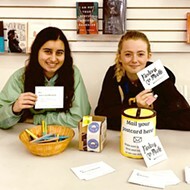 “If we would have said, ‘We’re going to use this money to lower class sizes and increase the number of art and music classes,’ we never would have gotten the grant. The federal government, he explained, wants to see a higher level of school accountability, and the data to prove it. There have also been reports of studies claiming merit-based pay programs have no impact on students’ standardized test scores. 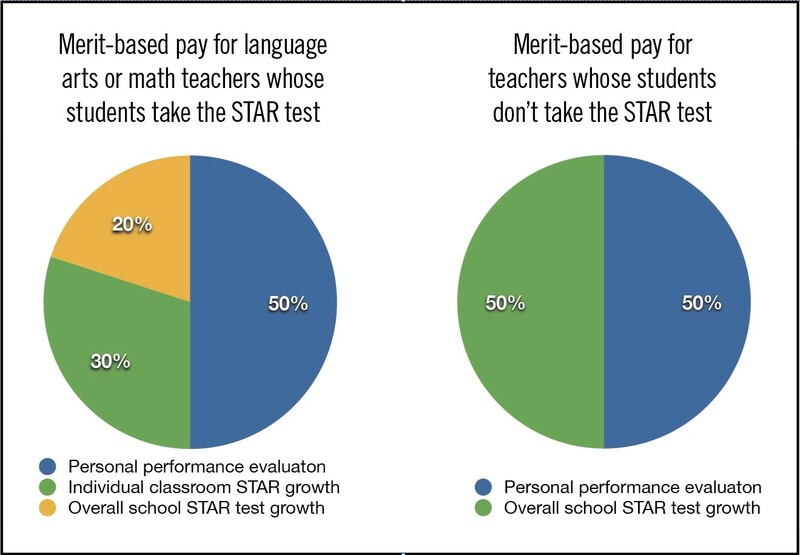 One study conducted over a two-year period by Mathematica Policy Rearch on a Chicago school system found merit-based pay didn’t improve student test scores or teacher retention. Chicago administrators argued that two years wasn’t enough time to prove the program’s success. Also, administrators said they chose to focus more on the teacher development aspects of the program, rather than teacher bonuses. Stenson said he’s aware of the Chicago study, and he agrees with the administrators. “Let’s say test scores stay flat. That doesn’t indicate that TAP didn’t work because the teachers get to decide what to focus on in their curriculum,” he said. “The teachers could choose to focus on student writing—a fundamental part of student education—but student writing doesn’t necessarily translate into bubbling A, B, C, or D on a test. “Finding grant money to make teachers better is in the best interest of everyone: the superintendent, the teachers, the kids, and the parents,” he said. Stenson speaks from the perspective of not just an administrator, but a parent. His two daughters currently attend school in the district. But with the way educational funding is going at the state level, class sizes aren’t going to be changing any time soon. Stenson, along with the vast majority of teachers in the district, believes TAP will make them better. 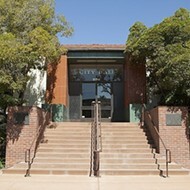 Nipomo’s Dana Elementary was one of the original six schools that voted on whether to implement TAP. Program officials require the teachers at a school approve TAP by at least 70 percent. Teachers at Dana only managed a 66 percent approval. Now an alternate school—Judkins Middle School—is getting the TAP money instead. “It’s difficult to turn down $1 million over five years,” Dana principal Paul Jarvis said. “The teaching staff seemed nervous about who the master teacher and mentor teachers would be. “We have a lot of very good teachers here and plenty of teachers with strong personalities, but ultimately no one came to the forefront for the position of master teacher. I think the staff would have preferred someone from the outside,” he explained. Dana teachers also expressed concerns about merit-based pay and about using an hour of the school day for professional development meetings. To decrease chances of rivalries, TAP requires that all teacher pay bonus amounts be kept confidential. Another concern from critics is that TAP turns a school into a business. Now that Dana has decided to go without TAP, Jarvis is busy thinking of new strategies to help his teachers and students. Let the TAP experiment begin. Amy Asman is Managing Editor of the Sun, New Times’ sister paper. Contact her at aasman@santamariasun.com.